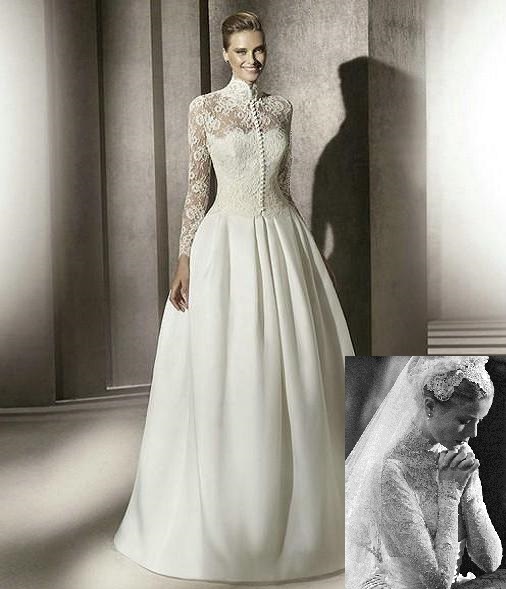 Home › Products › Wedding Gowns Blog › Want to look like a Royal Bride? Like me, I’m sure every little girl has watched a Royal Wedding on TV and admired the beautiful gown of the Royal Bride, and dreamed of wearing such a dress. The gowns of royalty are worth tremendous amounts of money and are made of pure Shantung silk and hand-made lace, but any bride can also wear and enjoy affordable wedding gowns which look similar to those worn by the rich and famous. One of my personal favourites is the elegant Wedding Dress worn by Princess Marie when she married Denmark’s Prince Joachim in May 2008. The Royal wedding gown was designed by Spanish-Italian fashion house Arasa Morelli, and the gown was floral pattern Irish lace from shoulder to hemline. A very similar look could be achieved by wearing this beautiful Satin and Embroidered Tulle Wedding Gown which is a strapless gown which comes with a lace shrug with lace sleeves and looks very regal, shown above. When the actress, Grace Kelly of Philadelphia, married Prince Rainier III of the sovereign city state of Monaco, she became known as Her Serene Highness Princess Grace of Monaco, and for the wedding ceremony she wore a modest long sleeved, high neckline gown of lace. A modern version of this traditional and lady-like bridal gown might be this lovely Satin and Lace Long Sleeved Wedding Dress, shown above. This beautiful classic Bridal Gown has long lace sleeves and a button-up front closure with tiny satin buttons and a high neckline and would be charming when paired with a lovely Lace-edged Bridal Veil. Our list of Royal Brides and Bridal Gowns would not be complete without including the dress worn by Catherine Middleton for her wedding to Prince William, the Duke of Cambridge, in April 2011. This gorgeous gown is reputed to have cost £200,000 or $350,000 as it was made of Satin Gazar and hand-made lace, but affordable reproductions can be purchased online, so that any bride can wear a similar dress to the Wedding Gown of Katherine Middleton which is available online for $395.00. So if your dream wedding is inspired by a Royal Wedding, there is no reason that you too, cannot be as beautiful as a Princess Bride on your wedding day!